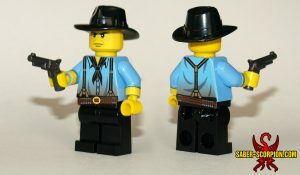 In the Wild West, many men live as Outlaws – some nefarious, others merely good men on the wrong side of the law. 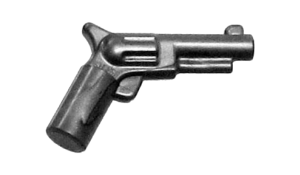 The outlaws’ hands are red with blood, but they search for redemption, seeking justice with their revolver. 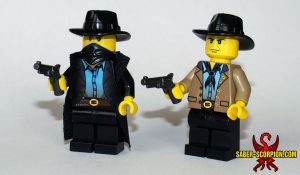 They’ll take their enemies down, dead or alive! 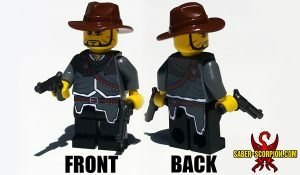 Includes stickers for 5 minifigs: the Sheriff (dark brown minifigure torso), Gang Leader (black torso, with stickers for front and back), Female Outlaw (white torso, dark brown legs), Crazy Outlaw (black torso, dark tan legs), and generic duster coat (dark tan), plus a generic face with dark red bandit mask.